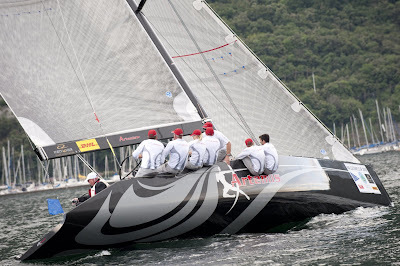 Copyright Loris von Siebenthal / RC 44 Class Association. At the helm of Artemis, the kiwi sailor is unbeaten after three matches. The Swedish boat leads the Series ahead of No Way Back, Ceeref, Organika, Team Aqua and Puerto Calero. 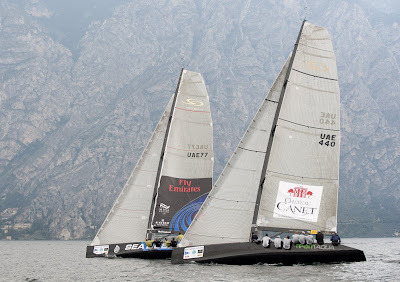 July 8, 2009 – Can anyone stop Dean Barker in Malcesine? The kiwi sailor is unbeaten after three matches sailed against Sébastien Col, Karol Jablonski and Larry Ellison. Four flights got completed today and eight more remain to be sailed tomorrow; needless to say that there’s still a long way to go.